Are you, like me, a Tour de France fanatic just waiting for the Tour to start? Can you name the winners of each Tour (yes, including a certain someone whose seven victories have been stripped) since 1980? Do “Alpe d’Huez” and “Mont Ventoux” bring iconic images of great victories to your mind? I can’t wait. But guess what? Before the start of the Tour, there is another great race that takes place and is being rediscovered by cycling fans: The Giro d’Italia. 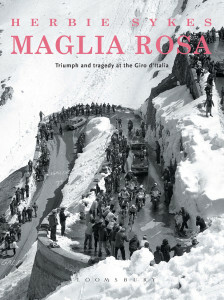 And there is a wonderful book out to help you appreciate this race and its venerable history and tradition: Maglia Rosa – Triumph and Tragedy at the Giro d’Italia by Herbie Sykes. In the foreward written by Andy Hampsten, the only American winner of the Giro, Andy states: “The Tour de France is a bigger race than the Giro. It has more media, more commotion, more people making demands on the cyclists’ waning energy. What it doesn’t have is the tifosi.” What are the tifosi? “The spectators at the Giro are tifosi, loosely translated as fan, with a heavy emphasis on ‘fanatical’.” And that fanaticism goes a long to defining the Giro. Through chapters with such titles as The Red Devil, Campionissimo, The Angel of the Mountains, The Savior of the Maglia Rosa, The Perfect Crime, and many more, this book tells the stories of great champions, colorful characters and exhilarating stages, delivers the beginnings and development of the Giro, gives behind the scenes history and detail, and offers a prognosis and direction for the future. was pink because that was the color of the paper the Gazetta was printed on? The very first of seventeen stages of the very first Giro started on May 13, 1908, at 2:53 a.m. At that moment, “127 moustachioed lunatics made off, destination Bologna, the small matter of 397 kilometers to the south east.” Dario Beni won that stage, but the overall victory went to Luigi Ganna. The standings were scored on penalty points rather than time, i.e., first place had 0 points, second place 1 point, etc. Overall, Ganna ended up with only 25 points while Giovanni Rossignoli, third overall with 40 points, had the fastest overall time by 50 minutes. In a book filled with such details, Sykes takes you through the decades with the Giro. Told on heavy, bright paper ideal for excellent photographs, you come to understand the nature, spirit, characters and heart of the Giro d’Italia. You discover that the Giro, more so than any other major stage race, has a nationalistic fervor and personality embedded within it. If you want to expand your horizon beyond the Tour, the Giro d’Italia is an excellent race to do so. And Sykes’ book will bring the history, excitement and uniquely Italian personality of that race to you.